Keep this brilliant design where you want eureka! moments happen. 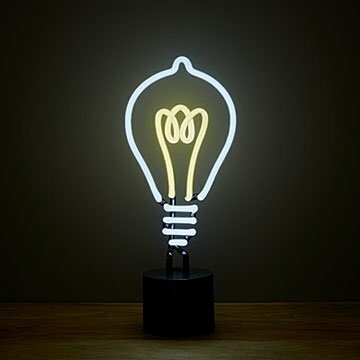 Wouldn't it be more fun if an actual lightbulb lit up when you had a brilliant idea? Keep this yellow and white neon design on your desk—or wherever you want eureka! moments to happen—and inspiration will never be far behind. Made in China. I was very pleased with this product! A fun design, great size, and a nice bright light. Overall more than I expected; I would highly recommend.